In fact I seem to spend half my life reading the words ‘fat-free’ or ‘reduced fat’ on food and drink packaging on the supermarket shelves, in magazines and on Television adverts etc. So is there any truth behind the myths? Well, for starters, around half of our cell membranes are composed of saturated fat… it makes no sense to me at all to cut out something from our diet that we’re actually made of. In reality, fat is an essential nutrient that is also an excellent source of energy for the human body. So really there is no need to run a mile when ever you see the word fat. Why are saturated and unsaturated fats in their most natural forms essential to the normal functioning of the human body? Absorption of fat soluble vitamins A, D, E and K.
The fats you need to try and avoid are usually the fats that are advertised to us as being ‘lower in fat’ and ‘healthier’. Trans fats (margarines, vegetable oils, butter replacements) are a group of artificial fats that occur on the heating of unsaturated fats, chemically altering their composition due to the process of hydrogenation. This is a process used to prolong shelf life of products and has created the so called bad guy image fat has been given. Such fats are often a hidden away in all our favourite junk food; cakes, biscuits and processed foods. These along with other heat or pressure treated fats like cooking oils (rapeseed and sunflower oil) should be avoided as the over processing of the fat has caused oxidation to occur thus creating lots of free radicals – more bad guys! Free radical exposure can lead to increased inflammation and lots of other unwanted problems. 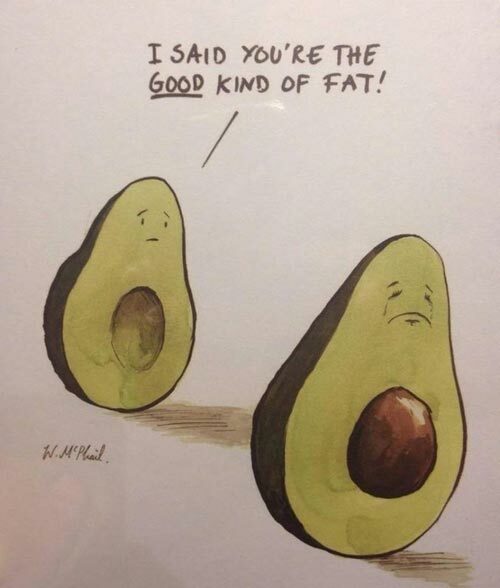 The advantage to eating good fats is that they absorb fat soluble vitamins A, D E and K, all of which are antioxidants, which help to prevent oxidation and the build up of free radicals. Steer clear of these and instead enjoy the odd bit of real butter – I know you want to! I’m not saying completely change your diet and eat loads of fats. Just like anything else, moderation is key and making sure you choose the good guys over those mean nasty trans fats. So live a little, stop buying foods that are free of fat and instead think more about what they are adding to the food to replace the fat… usually tonnes more sugar and other processed sweeteners. Don’t make the mistake of cutting out the good stuff.